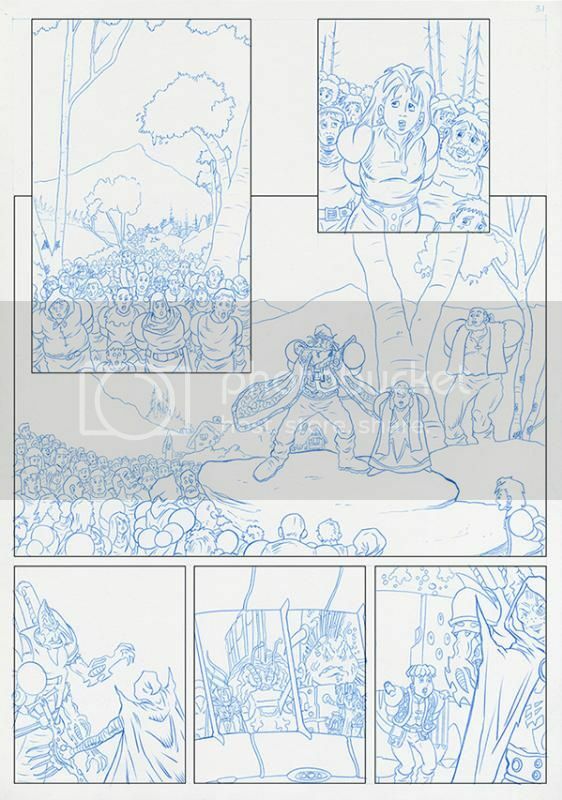 This week is the first of those and we are proud to announce that we are unveiling ONE page of Tim's pencilled artwork for Worlds End - Volume 2 - A Hard Reign's Gonna Fall PER Day for the NEXT FIVE DAYS!!! Here is the fourth page of our ONE Page a Day for the next FIVE Days event on the run up to Tim's attending the True Believers Comic Festival this coming Saturday 7th February. You can find these pages all week here on the Worlds End News Pages and the Wizards Keep Website News Pages, as well as links from all our other networks. Tim will also have this artwork with him at the festival for Fans to come along and check out. This is the very first time this artwork has been shown in this form and the first artwork to have been shown since July 2013. As always Tim looks forward to hearing your thoughts on his latest work. Check back TOMORROW for the grand unveiling of the fifth and last of the five pages in this promotional event. Don't forget to continue to check out the News Pages for more updates on events, appearances as part of this year's celebrations, as well as further information about Worlds End - Volume 2 - A Hard Reign's Gonna Fall.